Lets face it, most chickens look the same; they are either a brown or a speckled bird with little or no intelligence. They lay eggs and you eat them on a Sunday. OK, so perhaps for those of us who do actually have an interest in chickens this is not the case, but for your average city family this is about the limit of their knowledge of different breeds. However, if you go to any poultry show one of the most instantly recognisable breeds, even to those unfamiliar with poultry, is that round powder puff of a chicken that looks like it’s covered in fur rather than feathers. Anyone can spot this popular breed and even its name gives you an idea of what it looks like – the Silkie. 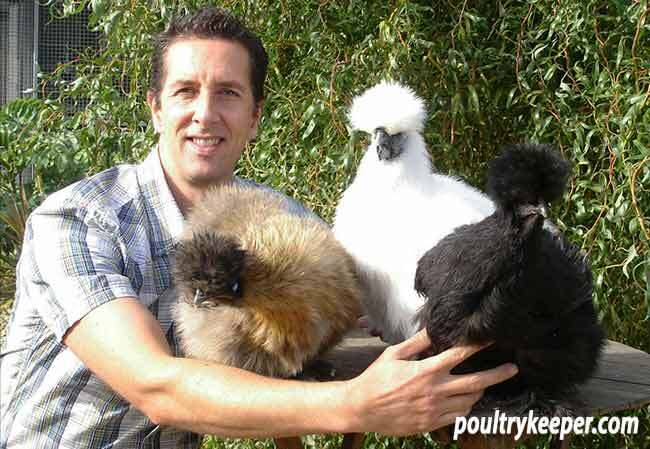 Laurence and some of his Silkies: A Partridge, a White and a Black. The silkie is one of the oldest breeds on record, and is known by fanciers for being ‘discovered’ by Marco Polo, who wrote of hens which had “hair like cats, were black and laid the best of eggs”. Subsequent naturalists have described the Silkie, amongst other things as a cross between a rabbit and a fowl, as well as an abomination not fit for the table, which is understandable when you consider the silkie had dark grey almost black flesh and bones- tasty but not very pleasant to look at! Having been classified as a breed in the 1872 Crystal Palace Show, modern day exhibition Silkies owe much of their current type to work by Mrs A Campbell (originator of the Campbell duck) in the early 1900’s. Her committed work and attention to type did much to improve the overall quality of the birds more in line to those seen today, in fact some breeders claim to be able to trace the lineage of their lines back to her original birds. A popular and unique breed, the Silkie is instantly recognisable by its pompom, fifth toe, black skin and profuse fluffy plumage, caused by an absence of barbs on the feathers which prevents them from knitting together. Originating in Asia, the Poultry Club of Great Britain classes the Silkie as a Light, Soft Feather breed, which can be large or bantam (miniature). Described as stylish, compact and lively, enthusiasts of the breed will agree that there is nothing quite like a Silkie. Easily tamed and great as a ‘sitter’, the breed is famed for its broody instinct and will successfully brood the eggs of other birds such as ducks. So strong is this instinct that the hen will sometimes go without food and water so you will need to keep an eye on her. 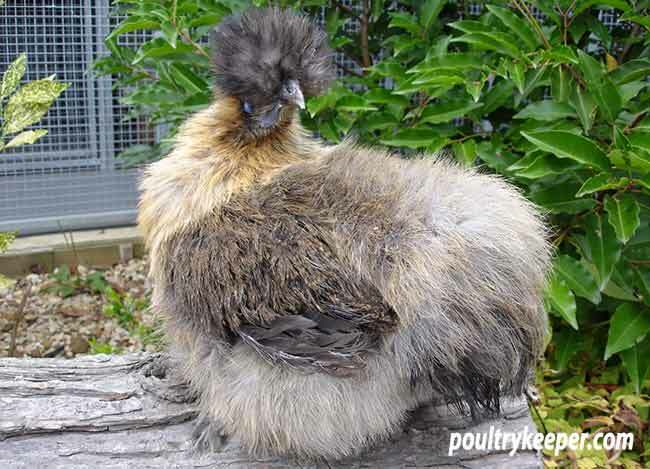 One downside to the silkie’s broody ability is the dense underfluff which can fatally tangle around the young chicks, so a Silkie cross with harder feathers is a better alternative if you wish to do this. A superb pet for children, this breed is very docile and the cockerels very placid and not particularly noisy. 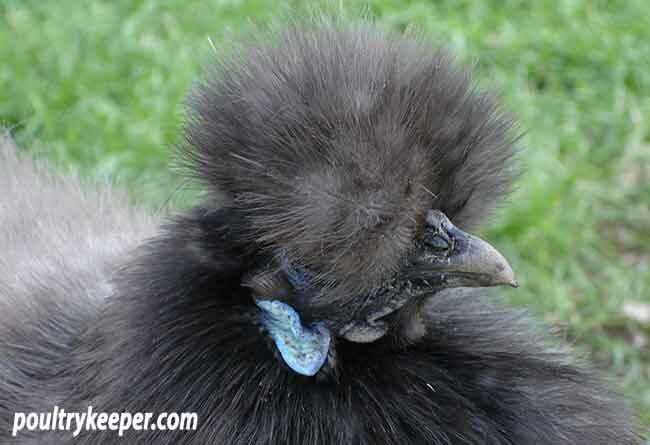 Easy to hand tame, Silkies do not fly and are easily confined behind a low fence. Hens come back into lay around New Year so are reliable when other breeds are still off lay. Unfortunately susceptible to Marek’s Disease, you will need to ensure stock is vaccinated unless you prefer to breed for resistance. Colours include white, black, blue, partridge and gold. Red and Cuckoo are not yet standardised although are in the process of being perfected. The feather type is recessive. Cross a silkie with any hard feathered bird, and the offspring will be hard feathered. Cross these offspring together and you will get some silkie feathered birds. Toes – the five toes are the result of ‘polydactyl’ which increases the number of toes, plus the intervention of another gene that limits them to 5. If your line of birds is suffering from a shrinking toe size, successive generations will lose the toe further, starting with the nail. A white bird is a coloured bird with a missing ‘colour developer’ gene. 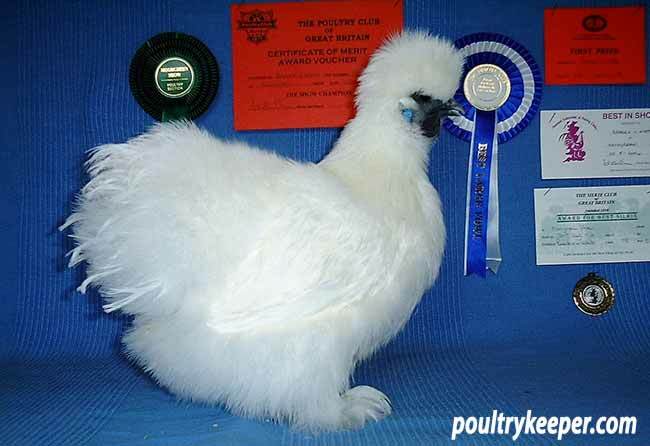 Probably one of the most popular of the exhibition breeds and certainly one of the best suited for showing, silkies are normally found on championship row of the larger shows, and have a history of being a good ladies exhibit (popular with female exhibitors as opposed to only shown by women!). Preparation is an art in itself, and clever washing and drying at the correct time before a show will fluff a bird up beyond expectation, and certainly is worth the effort if you wish to compete: a badly prepared bird will fail to do well regardless of its genetic quality. Silkies lay early in the New Year, often coming into lay just after December as the days lengthen. This is great if you want to get a head start with the shows as the birds will have matured sufficiently by the time the major ones start, and a silkie does need maturity to show off its shape well. Eggs should be collected a couple of times a day to prevent broodiness and stored in a cool room (a spare room with the radiators turned off is often used). Incubation is no different to any other breed; it is the hatching which may take a little extra vigilance. Many of the exhibition lines have a thickened membrane in the shell which, combined with humidity, the larger than average feet and enlarged head dome can make hatching difficult. If after pipping no progress has been made within 2 hours, you may want to intervene and help the chick out depending on your ethos. I have in the past helped out my whites but left my blacks who seemed to pop out like peas from a pod! Only your preference and experience of the line can guide you here on what is best for you.